The Society holds one of the major repositories of McLoughlin Bros. materials, including over 1,700 picture books, games, paper toys, publishers' catalogs, and original art work. McLoughlin publications are particularly well known for their use of colored illustrations, which were hand-stenciled during the firm's early years and printed using chromolithographs and photo engravings later on. The collection represents a departure from the usual collecting policy of the Society, for the imprints within it range from the 1850s to well into the twentieth century. The bulk of the collection is the gift of AAS member Herbert H. Hosmer (1913-1995), who had acquired much of it from Ruth Miller, the daughter of McLoughlin Brothers Vice President Charles Ernest Miller (1869-1951). The McLoughlin Bros. - Hosmer Archival Drawings and Prints is a magnificent collection of drawings and proofs originally belonging to the McLoughlin company archives. This collection contains over 760 pieces created between the establishment of the firm in 1858 and its sale to Milton Bradley in 1920. The majority of the pieces date from McLoughlin Brothers' commercial and artistic halcyon period between 1880 and 1900, and includes drawings by Enos and Frances Comstock, Palmer Cox, Georgina A. Davis, Anthony Hochstein, Justin H. Howard, Sarah Noble Ives, and Ida Waugh. In 1997 the Society acquired 745 items in forty-seven boxes including watercolors, pen and ink, paste-ups and proofs. This material, McLoughlin Bros. Collection - 1997 Addition, ranges in focus from object-lessons and alphabets, to fairy tales, religious and hunting scenes. The collection also includes McLoughlin Bros. Catalogs, Price Lists, and Order Forms ranging in date from 1867 though 1947. 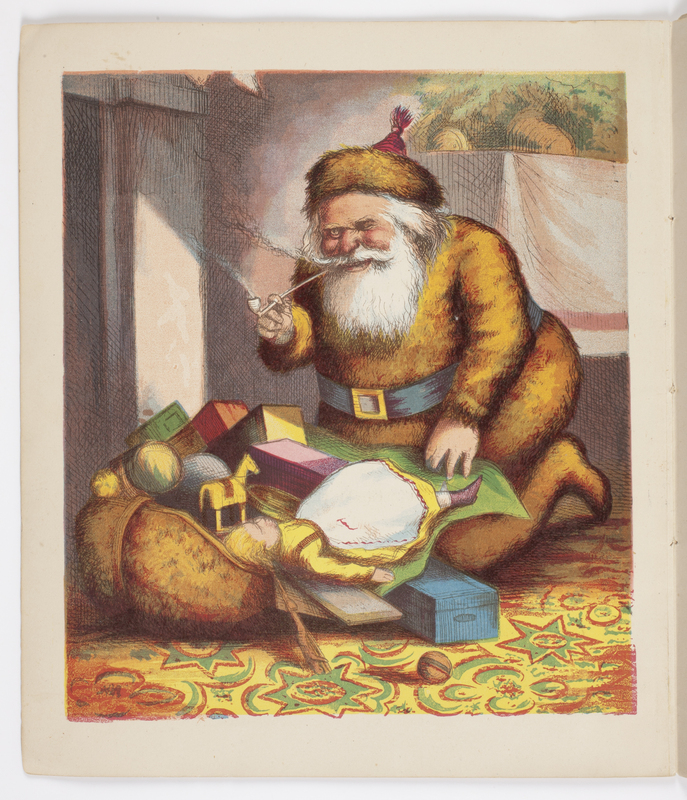 Brief History of the McLoughlin Bros.
McLoughlin Bros., Inc. was a New York publishing firm that pioneered the systematic use of color printing technologies in children's books, particularly between 1858 and 1920. The firm's publications served to popularize illustrators including Thomas Nast, William Momberger, Justin H. Howard, Palmer Cox, and Ida Waugh. The artistic and commercial roots of the McLoughlin firm were first developed by John McLoughlin, Jr. (1827-1905), who as a teenager learned wood engraving and printing while working for Elton & Co.--a New York firm formed by his father John McLoughlin, Sr. and engraver/printer Robert H. Elton. 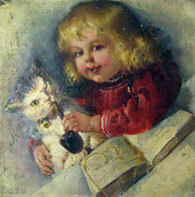 Elton & Co. (active 1840-1851) printed and issued toy books, comic almanacs, and valentines. Between 1850 and 1851, John McLoughlin, Sr. and Robert H. Elton retired--giving John Jr. control of the business. (1) He started to publish picture books under his own name, and soon acquired the printing blocks of Edward Dunigan, a New York picture book publisher for whom Robert Elton had executed many wood engravings. According to John McLoughlin, Jr.'s obituary in Publishers' Weekly (May 6, 1905), he made his younger brother Edmund McLoughlin (1833 or 4-1889) a partner in 1855. However, the firm was not listed in New York city directories as McLoughlin Bros. until 1858. During the early years of this partnership, the product line expanded to include non-book toys including games, blocks, and paper dolls. By 1863, the firm had expanded from its original headquarters at 24 Beekman St. to include 30 Beekman St. John McLoughlin, Jr. continually experimented with color illustration--progressing from hand stenciling, to the mechanical relief process of zinc etching, to the planographic process of chromolithography. In light of the firm's commercial and creative development, McLoughlin Bros. moved to 52 Greene St. in May 1870, and subsequently moved the main New York office to 71 Duane St. in February 1871. (2) In this same year, the McLoughlin firm opened a color printing factory at South 11th and Berry St. in Brooklyn. This factory employed as many as 75 artists, and is the probable site of the firm's experimentation with color reproduction techniques. 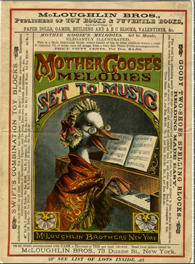 By the 1880s, McLoughlin books were regularly featuring titles in folio formats, illustrated by chromolithographs. A number of titles were probably "pirate" editions of picture books issued in England by firms like George Routledge & Sons. After John McLoughlin, Jr.'s death in 1905, the McLoughlin firm suffered from the loss of his artistic and commercial leadership. In 1920, McLoughlin Bros., Inc. was sold to Milton Bradley, the Brooklyn factory was closed, and the company was moved to Springfield, Mass. 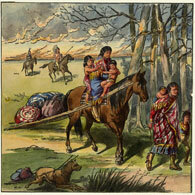 With this sale, McLoughlin Bros. ceased game production, although the publication of picture books continued. McLoughlin Bros. enjoyed some success in the 1930s with mechanical paper toys called "Jolly Jump-Ups," but the McLoughlin division of Milton Bradley stopped production during World War II. Between 1950 and 1951--apparently amid the threat of liquidation, the McLoughlin Bros. executive officers divided among themselves the firm's archival collection of books, drawings, company correspondence, illustration blocks, paper dolls, free standing wooden dolls, puzzles, and games. In December 1951, the McLoughlin Bros. trademark was sold to New York toy manufacturer Julius Kushner. Under Kushner's leadership, some popular favorites like the Jolly Jump-Ups were reissued. However, the McLoughlin line of children's books was sold to Grosset & Dunlap in June 1954. Since that date, several books bearing the McLoughlin Bros. imprint were issued, but the name dropped out of print by the 1970s. Since 1970, McLoughlin products have enjoyed great popularity with collectors, and their visibility continues through displays at book fairs and in catalogs like New York book dealer Justin Schiller's Catalogue 35 (1978) devoted to McLoughlin wood engraving blocks. (1) The New York city directory published in 1851 lists John McLoughlin, Jr. on his own as a bookseller. (2) "John McLoughlin [obituary]," Publishers' Weekly, 67 (May 6, 1905):1286-1287. (3) Catalogue of toy books. (New York: McLoughlin Bros., 1886). This collection consists of picture books, drawings, company correspondence, illustration blocks, paper dolls, puzzles, and games. This collection contains picture books, original artwork, cover proofs, publisher's catalogs and price lists, paste-up book dummies, and manuscripts.